This book explores the intersection of two emergent and vibrant fields of study in international human rights law: transitional justice and corporate accountability for human rights abuses. While both have received significant academic and political attention, the potential links between them remain largely unexplored. This book addresses the normative question of how international human rights law should deal with corporate accountability and violations of economic, social and cultural rights in transitional justice processes. 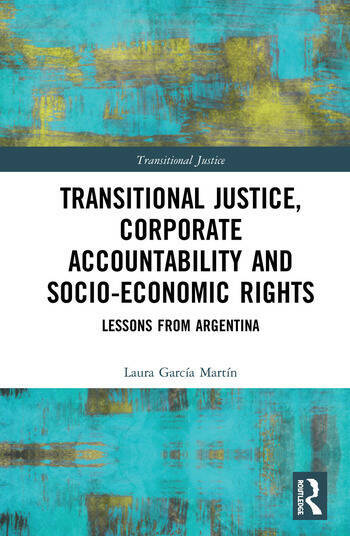 Drawing on the Argentinian transitional justice process, the book outlines the theoretical and practical challenges of including corporate accountability in transitional justice processes through existing mechanisms. Offering specific insights about how to deal with those challenges, it argues that consideration of the role of all actors, and the whole spectrum of human rights violated, is crucial to properly address the root causes of violence and conflict, as well as to contribute to a sustainable and positive peace. This interdisciplinary book will be of interest to students and scholars of transitional justice, human rights law, corporate law and international law. Intermediate conclusions: A unique model of transitional justice? Laura García Martín is a postdoctoral researcher and teaching assistant at University of Seville and University of Antwerp. Her research interest include the socio-economic dimension of transitional justice and business and human rights.